The water colour is very sensitive to any attraction that is produced on its surface. This quality is an advantage when the techniques that provoke such changes are known. 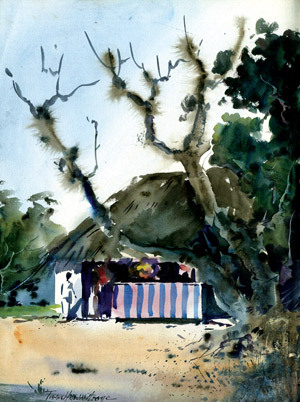 Over the years a false my stique has been built up around the subject of water colour painting and the practice is seemed to be weighed down by rigid rules, dogma and ritual. When using water colours, accidents often happen, like a scratch of paper scraping with the brush or many other incidents. There are many techniques that normally can be used to alter the surface of water colour. One of the most usual tools in the studio of a water colourist is the hair dryer. This can speed up the water evaporation from the paper. Another tool that can modify the surface of the paper is sandpaper. For instance the dark colour is painted in the used way. In this exercise I am going to introduce some textures with sandpaper on painting of rocks. The colours used for the rocks can be very dark. Some techniques are done when the colour is completely dry. To accelerate the drying of the colour and to be able to work on the dark mass, the paper is dried with a dryer. If the paper is too wet it is wiser not to get very close with the dryer so that the colour that runs on the drying is irregular on the surface. Rub the surface of the rock with a medium grain sandpaper. This causes the upper layer of the paper to be taken off and the dry colour with it. It is not necessary to press too hard. Some areas can be left untouched. Just rub where you want to texture the surface. Next you can repaint on the retextured surface with very transparent washes or with dark colours without completely covering up the surfaced area. The effects that can be achieved without water colour can be realized on a completely dry surface, or on fresh paint. When the paint is wet it is possible to achieve more varied results, for it is not just a question of getting rid of the paint. Depending on the type of paper, the painting can be scored with groves that does not completely take off the superficial layer. Here the experiment will be done with fresh paint. At the opposite end to the hairs, that is to say the tip of the handle, there is another very practical tool which offers many possibilities. Different tasks can be done with the sharp paint of the brush, especially when the water colour is moist. Some brushes have a sharp tip and others have a blunt one. Some water colour brushes even have a bevelled tip, specially designed to scrape the paint. While the painted surface is still moist, start with the tip of the brush. Do not press too hard: the smallest indentation is enough to mark the paper. The indentation made on the paper, more colour is accumulated than the rest of the surface, unless you insist several times with the brush. In this case pass the brush over each stroke. By so doing, instead of building up more colour, part of it is taken away and this makes the result a clearer and finer tone. When the tip of the brush is pressed hard over the still moist background it is possible to open up whites like those among the trees that are shown here. To make these type of marks not all brushes will do. Some have a tip that is too blunt. It is necessary to make the indentation that removes some of the paper. A sharp toothpick can be used. The legend is that watercolour, once put on the paper, is there for good and can't be altered, which is why so many would-be water colours painters don't try it. The truth is of course very different. Whole areas or sometimes the whole painting can be washed off and repainted without anyone being any wiser. I call it 'the sink treatment' and it is first regarded with amazement. If you consider watercolour is like walking on a tight-rope, this is a safety net. You will often get troubles with foregrounds. The top of the painting may be fine but something awful comes over people when they put in foregrounds. They are unsure of themselves, and it shows. It often turns out to be a tired over worked, muddy mess. First let the whole painting dry completely, this is very important, then put the paper in the sink and turn the tap on gently until the whole thing is immersed and the water is flowing over it. Surprisingly, nothing happens to the colour until it is touched and then it flows away. I use my hake brush gently to take away the ruined portions. It often happens when distant hills or trees are painted in too dark colours, bringing them too far forward. A gentle touch of the hake brush and they gradually fade until they turn about right. Of course, if the whole painting has been overworked and is muddy you can remove it, just leaving a faint image of the original. Lift the paper out of the water and put it on a drawing board to dry. Once it is dry you can paint over it but if you want a wet - into-wet treatment you can recommence the painting before it dries. Some colours leave a strain on the paper that no amount of washing can remove. Don't wait until you come across crucial problems. I have experienced various watercolour papers respond differently to the treatment. I know just how usual Kent drawing paper reacts but I might have to treat Whattman and Bockingford in a different way. Do try it, Turner did. I usually keep a small natural sponge while painting for all sorts of purposes. It can be used to lift almost any colour clean while the paper is still moist, such as wiping out light clouds in a darker sky. Its main use is to produce texture by dabbing it, loaded with paint, gently on to paper. Keep on experimenting you'll find endless possibilities. There are all sorts of ways of applying watercolour with a knife and again experimenting will show you how. You hold it as if you were going to cut the paper with the tip and produce fine lines for twigs, branches or short sideway strokes to paint birch trees. Observe the painting I have done titled a 'way side boutique' study the distant tree on the left and the huge tree on the right. I have used the knife to scrape on a wet layer of paint. By scraping already applied paint in a sort of spreading butter motion you can produce interesting textures. Look at the huge tree which is more dominant. The trunks are produced by a succession of strokes with a scraping knife. Timing is important, if the paint is too wet the stroke will fill in and it will finish up darker than light. The effect of spatter is very simple and can often be used legitimately to indicate pebbles on a beach or give interest to a foreground but to see it on painting after painting is a bore. One method is to tap a brush loaded with rich paint and not much water on the handle of another brush held in your left hand. A shower of spots will fall on the paper, the size of which can be varied by changing the distance between the brush and the paper as done on this painting warnings still hold well but I'll leave it to your own good taste and direction not to overdo things.